Vision problems may result when you stare at computer screens, smartphones, tablets, and e-readers for too long. Excessive screen time may result in headaches, dry eyes, eyestrain, blurred vision, and shoulder and neck pain. These symptoms are temporary and resolve when you limit or take a break from screen time. To minimize computer eyestrain, position the monitor so that is approximately 2 feet in front of you. Make sure you have adequate lighting to reduce glare. 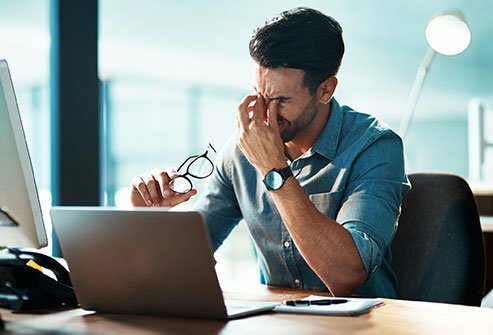 Experts recommend following the 20-20-20 rule to minimize the risk of eyestrain and other symptoms associated with looking at screens. The rule is to look at an object that is 20 feet away for at least 20 seconds for every 20 minutes that you are on the computer or looking at another device screen. Eyes are vulnerable to damage from ultraviolet (UV) rays from the sun, chemicals, and accidents. Protect your peepers by wearing sunglasses that have UV protection while outdoors. 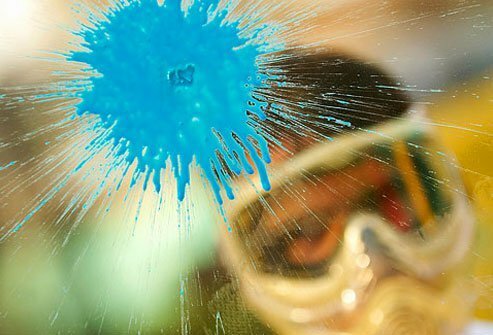 Wear protective goggles when you are working with machinery, tools, or caustic chemicals. Approximately 2,000 people every day in the U.S. suffer eye injuries while on the job that require medical treatment. An injury to the eye or chemical exposure could even lead to blindness. It is estimated that 90% of these eye injuries could be prevented or minimized if people wore adequate eye protection. Wear protective eye goggles or even a face shield when working with tools or chemicals at home or on the job. Wear sunglasses while outside to protect yourself against UV sun exposure. Is It Time for 'Readers'? Most people need to use reading glasses to see things up close once they reach a certain age, usually by age 40 or older. The inability to see things clearly up close is called presbyopia. Eyeglasses called "readers" improve your ability to see things that are close up more clearly. You can purchase readers over the counter at pharmacies and other venues. They are available in various strengths, but unlike prescription eyeglasses, they will not be tailored to your vision. Usually people need different prescriptions for each eye, so standard readers may not be appropriate for you. You can also correct your vision by wearing contact lenses or getting laser surgery. The rates of both myopia (nearsightedness) and hyperopia (farsightedness) increase with age. About 25 percent of adults between the ages of 40 and over are nearsighted and about 10 percent of adults over the age of 40 are farsighted. Nearsightedness and farsightedness are common eye problems. You can correct your vision by wearing prescription eyeglasses or contact lenses. See your optometrist to test your vision and discuss whether eyeglasses, contact lenses, or a combination of the two are right for you. Presbyopia is a normal process associated with aging of the eyes. The lens of the eye is very flexible before the age of 40. This flexibility makes it easy for the eyes to focus on objects that are far away or close up. The lens becomes less flexible as we age. This makes it more difficult to focus on objects that are close up. Inadequate or poor lighting makes the problem worse. People with the condition often hold books or menus at a restaurant farther away to be able to read from them more easily. Some diseases that you would not necessarily associate with the eyes can negatively impact vision. Diabetes and high blood pressure can lead to eye conditions and visual impairment. Diabetes is a top potential cause of blindness in adults. Diabetic retinopathy is a condition that leads to damage to blood vessels that are located in the retina. Symptoms of diabetic retinopathy may include blurriness, trouble perceiving colors, dark areas of vision, and floaters. 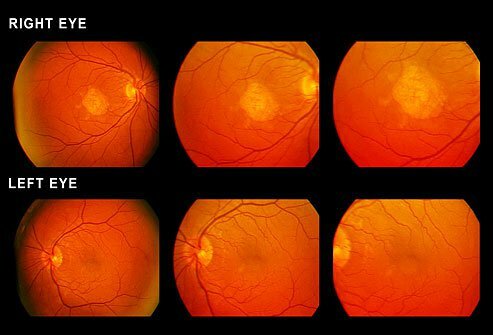 Diabetes may cause retinal artery occlusion. 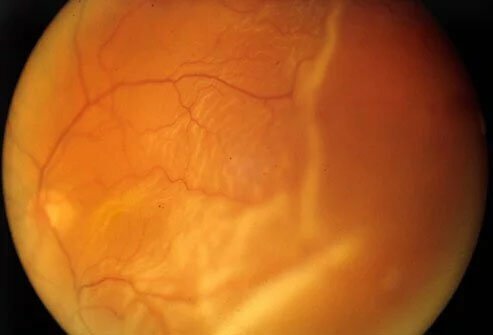 This condition causes a blockage in a small artery that delivers blood to the retina. High blood pressure can potentially cause permanent loss of vision by damaging nerves and blood vessels in the eyes. If you experience any problems including eye pain, floaters, lazy eye (amblyopia), uveitis, astigmatism, conjunctivitis (pink eye), red eyes, nearsightedness (myopia), farsightedness (hyperopia), retinal detachment, blepharitis, corneal disease, strabismus, pinguecula, retinal disorders, keratoconus, retinitis pigmentosa, sudden loss of vision or blindness, vision problems, chalazion, or droopy eyelids, see your eye doctor right away. Everyone should have regular eye exams to screen for eye diseases and eye problems, but it's especially important to see the ophthalmologist when you are experiencing eye symptoms. Conjunctivitis caused by viruses or bacteria is highly contagious! Wash your hands frequently and do not touch your eyes to avoid spreading it to others. An eye doctor can examine the corneal tissue, retinal tissue, macular tissue, eyelids, conjunctiva, subconjunctival tissue, and other tissues of the eyes during an eye exam. It is possible to develop glaucoma and cataracts at any age, but these common eye diseases happen most often in people who are over the age of 60 years old. 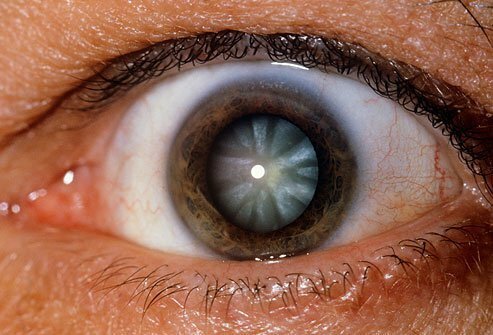 Cataracts are cloudy growths that occur on the lens of the eyes. They can cause vision loss and interfere with daily activities like driving, watching TV, and reading. Cataracts can be removed surgically. Glaucoma is a condition where the optic nerve that connects the eye to the brain is damaged. High eye pressure in the eye (intraocular pressure) is the most common cause of this condition. Doctors treat glaucoma with medicated eyedrops. Sometimes, a doctor may perform surgery to decrease pressure in the eye. The most common form of glaucoma is open-angle glaucoma. The vast majority of glaucoma cases, at least 90%, are this type. Open-angle glaucoma occurs when the drainage canals in the eyes become clogged. This increases intraocular pressure. Symptoms of this type of glaucoma may include blind spots in the peripheral or central vision and tunnel vision as the disease progresses. Age-related macular degeneration (AMD) is a common condition in people who are 50 years old and older. It is a leading cause of vision loss, but the eye disease does not lead to complete blindness. It damages the macula which is an area of tissue in the center of the retina. That part of the eye is critical to central vision, the vision that is necessary to see fine details and objects that are straight ahead. There are two types of age-related macular degeneration. "Wet" AMD is the type that is caused by blood vessels that leak blood or fluid into the macula. The condition is treatable with medication. "Dry" AMD is a slower disease process. 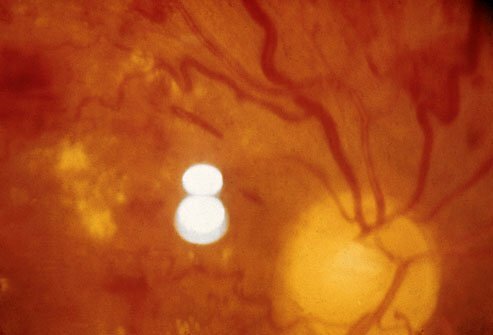 In this form, small yellow deposits called drusen appear under the macula. There is no specific treatment for dry AMD. Your eye doctor may recommend certain vitamin and mineral supplements to slow down or stop the disease process. The doctor may prescribe a program of vision rehabilitation to help you adjust to living with AMD. The eyes are particularly vulnerable to harm from free radicals, unstable molecules that can potentially harm tissues. Certain foods are rich in nutrients that help protect the eyes against free radicals and reduce the risk of age-related eye conditions like cataracts and AMD. Nutrients good for eye health include vitamin C, vitamin E, omega-3 fatty acids, lutein, and zeaxanthin. 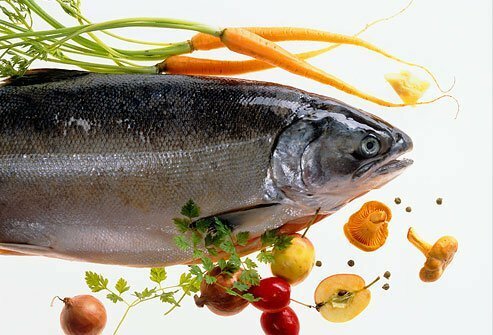 Foods rich in these nutrients include leafy greens, oranges, tangerines, fatty fish, and nuts. Eat a variety of colorful fruits and vegetables daily to help protect your eye health. Dry eye syndrome is a condition that is more likely to occur as we age. It results in the eyes producing fewer tears or tears that do not have sufficient lubricating quality to keep eyes moisturized. People with dry eyes may experience pain, discharge, redness, and alternating periods of tearing and dryness. The condition may cause heavy eyelids and blurry vision. Women are more likely than men to develop dry eyes, likely due to hormonal changes and increased risk of autoimmunity. People who have autoimmune conditions are more likely to suffer from dry eyes. So are those who have rosacea and blepharitis. Taking decongestants, birth control pills, antidepressants, antihistamines, hormone replacement, anti-anxiety medications, and blood pressure medications all increase the risk of dry eyes. 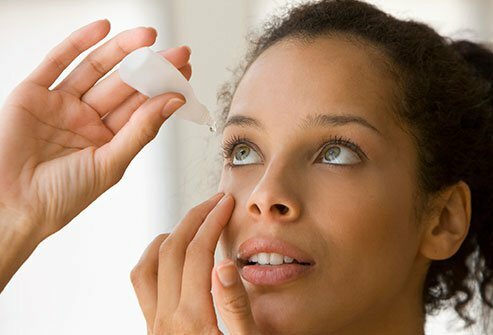 Over-the-counter (OTC) and prescription medications are available for the treatment of dry eyes. Detached retina is an eye problem where the retina, the part of the eye that is sensitive to light, detaches from the back of the inside of the eye. Retinal detachment is a serious eye problem and a medical emergency that needs immediate treatment to minimize the risk of permanent vision loss. Anyone at any age can suffer from a detached retina, but it is more likely to occur in those age 40 years and older. People who are very nearsighted or who have had cataract surgery or another eye condition are at increased risk of suffering retinal detachment. Have you ever noticed a light-colored ring around the iris of someone's eyes? It may be corneal arcus, or arcus senilis. The ring is made from calcium and cholesterol and is usually a gray-white color. Corneal arcus is common eye problem in people over the age of 60. This ring around the cornea does not affect vision, but it may be associated with changes in lipid metabolism. In one study, more than 70 percent of people who had corneal arcus had high fasting triglyceride levels, which is a marker of lipid metabolism abnormalities. 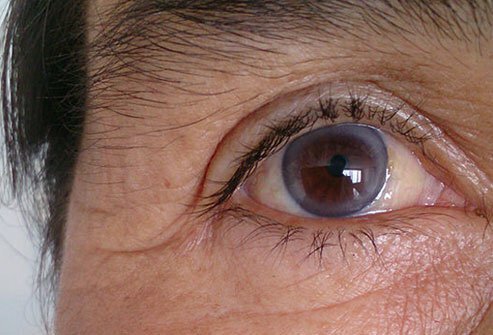 Muscles in the eyelid lose strength as we age. Tissues that that make up the eyelids also become looser. Gravity takes a toll as well. 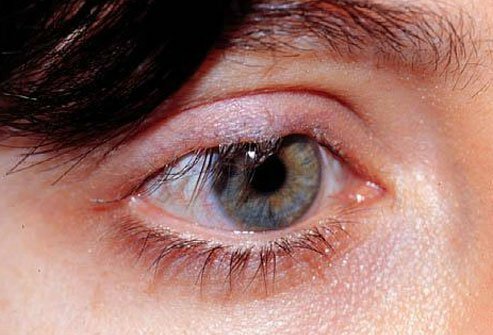 All of these factors may cause the lower eyelids to turn outward. The condition is called ectropion. The lower eyelids may turn inward. This condition is called entropion. It can be very uncomfortable because the eyelashes may rub against the eyeball. If the upper eyelid becomes droopy, this condition is called ptosis. All of these conditions may be treated surgically. Normal age-related changes to the eyes may cause vision trouble. Many people notice they need more light to read or do other close-up activities as they age. This is because the muscles that control the pupils are weaker and less responsive to light than they were in youth. Turn on bright lights when you read or are doing needlework or some other activity that requires you to see fine details. The lenses of the eyes change with aging, too. This may make light scatter on the back of the retina instead of come in more focused. This may lead to more glare, especially when you are driving. Wear sunglasses when you are outside or driving to guard against glare from the sun reflecting off of pavement or windshields. Investing in a good pair of sunglasses is important to protect your eyes, especially if you have become more light-sensitive. The lenses of the eyes are normally clear. As people age, the lenses may become discolored. 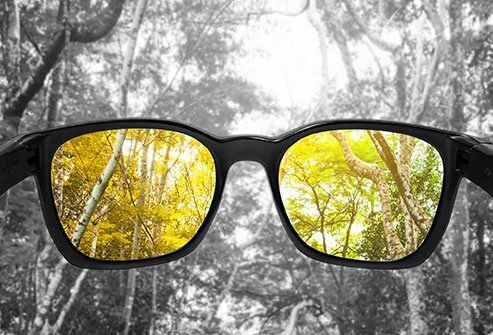 This may impair vision and make it hard to see colors as they really are. Colors may appear less bright. It may also be harder to distinguish different colors from each other. Aging may affect blue-yellow vision most so people have trouble distinguishing blue from purple. Color perception changes may also make it more difficult to distinguish yellow from green. American Academy of Ophthalmology: "Cataract + Glaucoma: New Options May Change the Equation," "Central Vision Loss," "What Is Presbyopia?" American Optometric Association: "Adult Vision: 41 to 60 Years of Age," "Computer Vision Syndrome," "Lutein & Zeaxanthin," "Protecting Your Eyes at Work." Glaucoma Research Foundation: "Types of Glaucoma." Journal of Pharmacy & BioAllied Sciences: "Significance of Corneal Arcus." NIH National Eye Institute: "Age-Related Eye Diseases," "Facts About Dry Eye," "Facts About Retinal Detachment." Ophthalmic Plastic and Reconstructive Surgery: "Involutional Entropion and Ectropion of the Lower Eyelid: Prevalence and Associated Risk Factors in the Elderly Population."